Are you someone who loves using essential oils to make your home smell amazing? I love using them in my home, especially for relaxatio. At night, I love putting peppermint oil in my diffuser and relaxing to the smell of peppermint as I listen to rain from our noise machine. One of the big issues I have seen with most diffusers though is that they are…well…kinda ugly. They usually stick out like a sore thumb unless you spend a lot of money getting a ‘designer’ one. 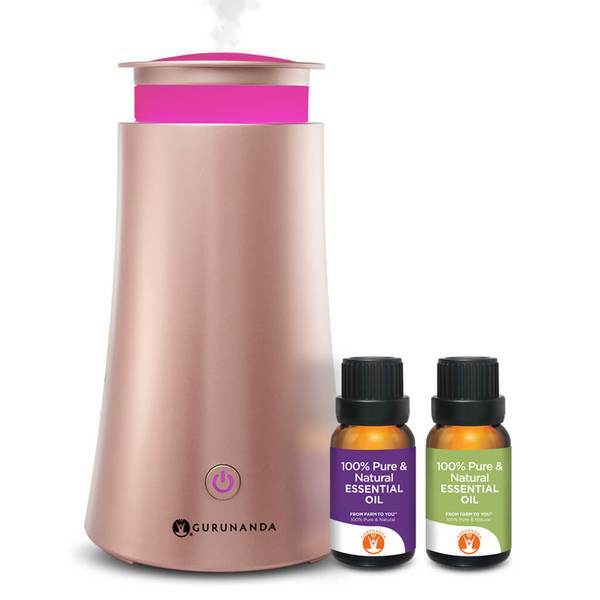 Last year though, I was introduced to a company that makes not just cute diffusers, but amazing essential oils too – GuruNanda. When I saw they had a new RoseGold Tower Oil Diffuser, I knew I had to try this cute diffuser! 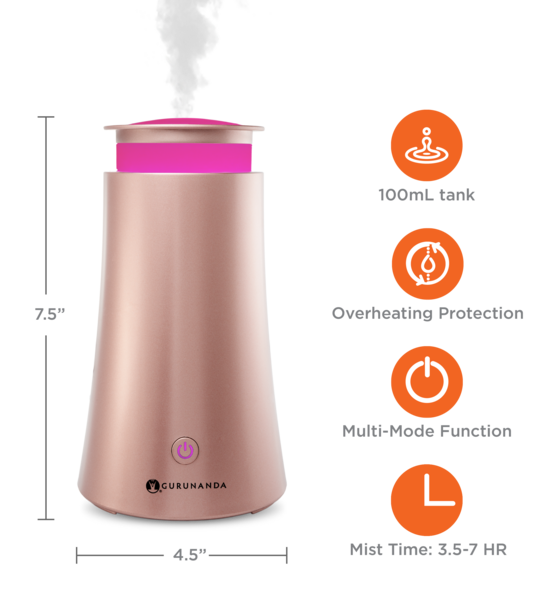 GuruNanda RoseGold Tower Oil Diffuser: What is It? Are you looking for a stylish diffuser? If so, we think you will love the GuruNanda RoseGold Tower Oil Diffuser. This high quality, easy to use diffuser uses ultrasonic waves to diffuse your favorite oils, allowing to enjoy natural aromatherapy. 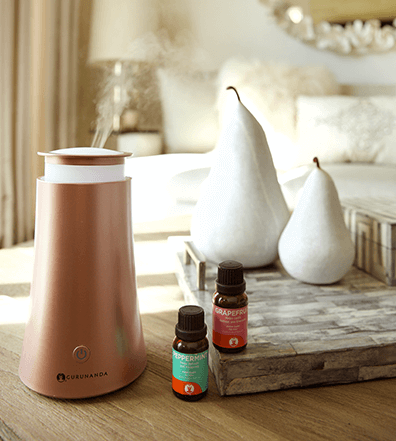 Best of all, this method creates a calming mist that disperses into the air without out heating or compromising the essential oils, allowing you to enjoy the full scent and any benefits of your favorite oils. With its fun LED lights and sleek, modern design, it is perfect for any bedroom or office. As someone who loves GuruNanda diffusers, I have to say that I am a fan of the new RoseGold Tower Oil Diffuser. While it looks similar in shape to my other diffusers, it is much more subtle and stylish with the rose gold design. As well, I love that it comes with two common, very useful essential oils – peppermint and lavender. It can also run up to seven hours, making it the perfect way to relax after a stressful day. That being said, it is important to note that the seven hours is in intervals. If you want to run it continuously, it will last for around 4 hours, which is still longer than many other diffusers on the market. Overall, the GuruNanda RoseGold Tower Oil Diffuser is a great diffuser for anyone who wants to enjoy aromatherapy at home, in the office, or even in a dorm room. GuruNanda RoseGold Tower Oil Diffuser: Where to Purchase? Want to purchase this oil diffuser for your own home? You can find the RoseGold Tower Oil Diffuser on the GuruNanda website for only $34.99. Want to learn more? Follow GuruNanda on social media! I do love the look of that diffuser. That’s a beautiful diffuser. I have 2 but none as pretty as this. I need one of these for my living room, I love the design. Will definitely check it out. I have a small room diffuser and it works ok. I would love one like this that is bigger and definitely prettier. I need a new diffuser, and I love the look of that one. I love the look of this diffuser! My sister and I were just looking at some different diffusers and I’m definitely going to look into this one. Omgosh it’s gorgeous!! I love it! Plus I love diffusing oils!! Seriously so amazing for you house! That is a really sleek, pretty diffuser! I haven’t tried diffusing oils in my home yet, but I’d love to! I’ve heard a lot of good things about it!